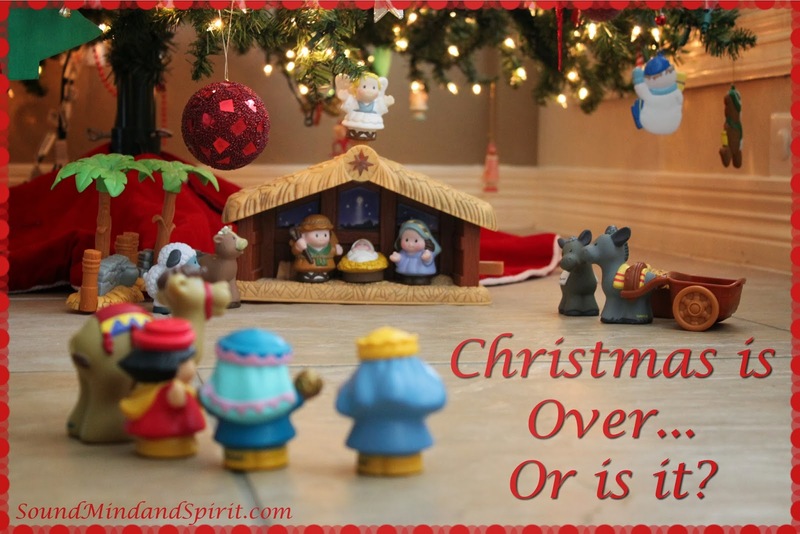 Of Sound Mind and Spirit: Christmas is Over! Or is it? Christmas is Over! Or is it? Whew! Christmas is over for another year! Or is it? Here at my house, it is still Christmas. We typically wait until after the Epiphany, when the Wise Men prostrated themselves before baby Jesus, to take down the Christmas decorations and end our celebration. I know many people do not understand why my Christmas tree still stands in the family room. After all, society begins to celebrate Christmas the day after Thanksgiving and stops on December 26th. Once New Year’s Day occurs, all remnants of Christmas is supposed to disappear as we begin to clean, purge, and organize our belongings in preparation for Spring cleaning. A few years ago, we made the decision to fully embrace the season of Advent, which is preparing for the arrival of the Christ child, and then joyfully celebrate Christmas throughout the full Christmas season, which ends with the Epiphany. There are many benefits to placing the emphasis of Christmas on the days after the holiday. Small things, such as not sending out Christmas cards until after Christmas Day, greatly reduces holiday stress for us. We also tend to be less busy in the last days of each year which allows us to fully appreciate and enjoy God's choice to become flesh and be born among us. It sometimes is difficult to remain in the Christmas spirit when the rest of the country has moved on after New Years. While everyone else rings in the new, we are also celebrating the Solemnity of Mary, the Mother of God and waiting for the Magi. 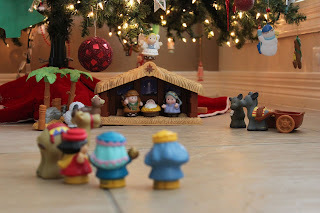 This year, I was really tempted to start taking down our Christmas decorations this weekend, but my 9 year old reminded me that our Little People Wise Men haven’t quite made it to the manger yet to see Jesus. So there they remain, the Holy Family under the tree and our little plastic Magi making their way slowly across the tile to honor Christ the King. With this small tradition, my husband and I are attempting to remind our children of the true meaning of Christmas and teach them that it doesn’t end when Santa visits our house. It is only the beginning of this joyful season. Merry Christmas to Your Family from Ours!